Bottom Line: True Health Ultimate Lectin Defense may help you if you’re sensitive to lectins. But, considering most of them are destroyed in the cooking process, it’s not something most of us have to worry about. 2. History of the Brand: How Did True Health: Ultimate Lectin Defense Start? 6. Who’s True Health: Ultimate Lectin Defense For? 7. How Does True Health: Ultimate Lectin Defense Work? 8. Does True Health: Ultimate Lectin Defense Work? 13. Any True Health: Ultimate Lectin Defense Lawsuits? 16. Would True Health: Ultimate Lectin Defense Work with Your Diet? 17. Verdict: Would I Recommend True Health: Ultimate Lectin Defense? Bottom Line: True Health Ultimate Lectin Defense may help you if you're sensitive to lectins. But, considering most of them are destroyed in the cooking process, it's not something most of us have to worry about. Lectins, or plant proteins, are the new gluten. Some experts say these proteins, found in many healthy foods, can cause digestive issues and make weight loss difficult for many people. I decided to give Ultimate Lectin Defense a try, to see if it could make a difference for me. In addition to trying the supplement, I wanted to learn more about the company behind it, the ingredients they use, and the science to support them. I also wanted to see what others had to say about their experience. In this review, you’ll find a combination of my personal experience with the results of my research. If you’re looking to lose weight or get healthier, I hope this review helps you determine whether or not you want to give this product a try. If you’d like to try it for yourself, True Health: Ultimate Lectin Defense can be purchased through Amazon or using their Official Site. Ultimate Lectin Defense is a supplement that claims to block the “troublesome” lectins from the foods you eat to get them out of your body. In the end, this is supposed to reduce the gas, bloating, and indigestion you deal with as a result of those proteins. Lectins are found in many of the healthy foods we’re supposed to eat for a nutritionally balanced diet, such as in nightshade vegetables (eggplant, tomato, peppers, and potatoes), beans and legumes, wheat, dairy products, peanuts, and more. According to the official company website, True Health was founded more than a decade ago. However, no specific year is given. I found a press release online from December 2010 that announces the release of the Ultimate Lectin Defense product. It seems that Dr. Michael Cutler M.D. is the main name behind the True Health company. According to him, lectins are sticky proteins that make up part of a plant’s immune system to create a barrier of defense for the plant. Your body accepts roughly 95% of the lectins consumed through diet and eventually excretes them through the body. But, the remaining 5% of lectins could possibly cause major damage. Dr. Cutler isn’t the only medical experts that claim lectins can be harmful to our overall health. True Health has a variety of products geared toward weight loss and overall health. They are all pills and supplements. Lectins, found in high concentration in nightshade vegetables such as eggplant, tomatoes, and peppers, are a diverse family of carbohydrate-binding proteins. NAG, D-mannose, and bladderwrack are sugar decoys that bind to and neutralize lectins. NAG targets the wheat lectins and is known to binds to lectins that mimic the effects of insulin. D-mannose attracts lectins found in beans, peas, and other legumes. Bladderwrack is a seaweed rich in fucose, which is a sugar that binds to candida yeast and other types of bacteria. together, these three ingredients stop the lectins from being absorbed by your digestive system. Okra powder works much like mucin. Mucin is a glycoprotein that creates a slippery surface along the digestive tract that makes it difficult for lectins to attach. Okra is rich in mucilage which is a gel-like substance that prevents lectins from attaching to the cells in your body. Okra has also been shown to support a healthy microbiome in your gut to help balance your bowels. Sodium alginate is a gel-like fiber that binds to lectins and helps your body excrete them. Research also shows that sodium alginate may act as a barrier to protect your esophagus from bile acids and caustic pepsin. The press release I found announcing the release of the product also says the company has offices in Alabama and product manufacturing occurs in the United States. However, it does not provide any information about the specific location the products are manufactured. Ultimate Lectin Defense is for people who believe they are sensitive to lectins, and want to continue eating them. It’s also for people who are seeking a lectin free diet, but want to be able to eat them from time to time without creating an issue with their diet. True Health Ultimate Lectin Defense works by preventing the lectins in the foods you eat from being digested. It works similar to the way fat blockers or carb blockers work, so you can eat the foods with lectins, without worrying about what the lectins will do to you as you digest them. Humans have problems digesting most lectins. Customers who use Ultimate Lectin Defense over the long-term in concert with a calorie-restricted diet may experience weight loss and maintenance. But, when you consider that’s the case for nearly any supplement you take, since it’s more about what you eat, it’s not really something to brag about. There is science to support these ingredients working to do the job they claim. However, there appear to be mixed results from people who use this supplement. Considering its ingredients are the same as other lectin blocking supplements available on the market today, it’s hard to say whether it really works. The company claims you’ll have less gas, bloating, and indigestion because of improved digestion. They also say you’ll get more pleasure because you’ll be able to eat the foods you love without digestive issues. I didn’t notice much of a difference when I tried this, but it could be because I am not as sensitive to lectins as others are. Many foods high in lectin are considered good for you. Cooking the food destroys most of the lectins. Because this is a capsule you take daily before each meal, there is no issue with taste. Ultimate Lectin Defense claims that since the product is all natural, there’s no need to worry about side effects. But because it’s possible for natural ingredients to interact with other supplements and medications, this is not necessarily the case. If you have thyroid issues, bladderwrack could make those problems worse because of the high iodine content. If you have a bleeding disorder, it’s worth noting that bladderwrack may also slow blood clotting. D-Mannose may also lead to diarrhea and bloating. If used in high doses, it could lead to kidney issues. If you are a diabetic, you may want to avoid this supplement because it may make it harder to control your blood sugar levels. There are no official product warnings. However, it’s always best to talk with your doctor if you are considering taking this or any other supplement. This is especially the case for children, women who are pregnant or nursing, and anyone who is using prescription medication to treat any kind of medical condition. I wasn’t able to find anything about lawsuits against this company. There are many competing supplements made with similar ingredients, including Lectin Shield, Lectin Lock, and Complete Plan Nutraceuticals Anti-Lectin. It should work with any diet, except for vegan. The capsule is vegetarian, so I’m okay saying that the NAG is likely made in a lab. NAG is sometimes sourced from shellfish, which would make it unsafe for vegetarians and those with allergies. As much as I would like to be able to recommend it, I can’t. I didn’t get results, and there’s just not enough proof that the formula really does anything for me to feel okay with recommending it to my readers. This, combined with the fact that it is highly similar to competing products that also come with mixed reviews just makes it too hard to recommend. If you’d still like to try True Health products, there are several promotional codes, like this one for 25 percent off, out there so you can try for yourself. 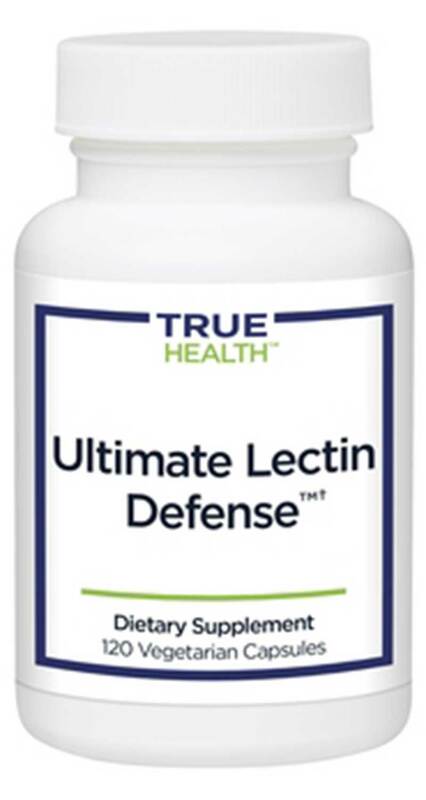 True Health: Ultimate Lectin Defense can be purchased through Amazon or using their Official Site.